The superior epigastric artery emerges around the sixth or seventh costal cartilage and is a section of internal thoracic artery. 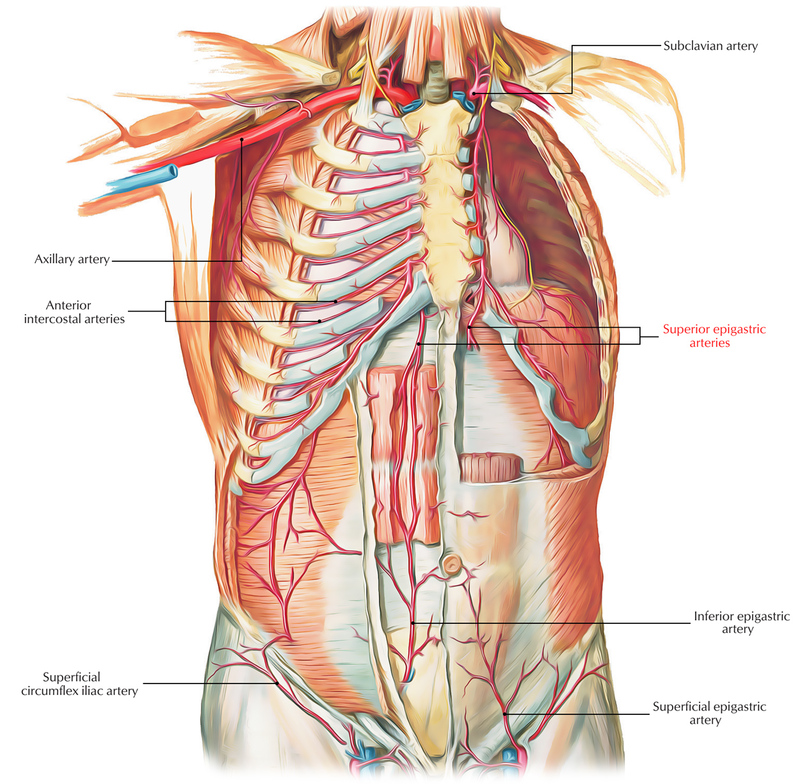 While moving across the diaphragm in the space between the costal as well as the sternal parts of the muscle, it declines to the anterior abdominal wall. The superior epigastric artery by entering the gap between the costal and xiphoid slips at the start of the diaphragm goes inside the rectus and also enters deep to the rectus abdominis. At the same time a section of external iliac artery, the inferior epigastric artery, by coming in front of the arcuate line moves in the sheath. These arteries circulate the rectus muscle and also anastomose along with each other inside the sheath. The internal mammary artery (A.k.a Internal thoracic artery) generates the superior epigastric artery along with the musculophrenic artery by dividing below the costal cartilage of the sixth rib. The superior epigastric artery goes into the medial posterior side of the rectus abdominis muscle and also passes through the posterior rectus sheath at the back of the seventh costal cartilage. The first large perforator that is often referred to as the superficial superior epigastric artery is oftentimes produced by this artery at the costal margin. This perforator bears no resemblance to the superficial inferior epigastric artery and is created by the deep system. The superior epigastric artery afterwards creates branches inside the rectus abdominis muscle and creating choke anastomoses or often a true arterial attachment on or around the level of the midpoint among the xiphisternum and umbilicus, proceeds caudally to connect with an equivalent member of the deep inferior epigastric artery. The superior epigastric artery gives lateral as well as medial branches and also it anastomoses around 4 cm above the umbilicus along with sections of the inferior epigastric artery. Left subclavian artery and right subclavian artery. Arteriosclerosis is the coagulation, along with hardening of the walls of arteries along with loss of elasticity. This activity over the course of time inhibits the blood flow to a person’s organs as well as tissues and can cause serious health risks induced by atherosclerosis, which is a certain type of arteriosclerosis caused by the accumulation of fatty plaques, cholesterol, along with other substances inside and above the artery walls. Atherosclerosis is a certain type of arteriosclerosis where an artery wall enlarges because of expansion of intimal-smooth-muscle cell generating an atheromatous (which contains fiber and lipid) plaque and infiltration and collection of white blood cells. It is likewise referred to as arteriosclerotic vascular disease.